Tragedy plus time equals comedy as the old adage goes, and, man, has director Ruben Fleischer ("Zombieland") picked a doozy of a tragedy turn into "30 Minutes or Less." Luckily, a lean script and a strong supporting cast, coupled with Fleischer's skill at blending action and comedy make "30 Minute" a ride worth taking. Back in 2004, a pizza delivery driver in Erie, PA, robbed a bank and during the ensuing standoff with cops, showed them a bomb strapped to his neck, one that he claimed had been put their by men he said had forced him to commit the theft under threat of blowing him up. Sadly, the bomb was detonated and Wells died—sadder still, it was later determined that Wells had actually been in cahoots with the bombers, but didn’t realize they would be saddling him with a real bomb. Seven years later, this bizarre tale is the inspiration for a new comedy starring Jesse Eisenberg. Aziz Ansari, Danny McBride, Nick Swardson and Michael Pena. 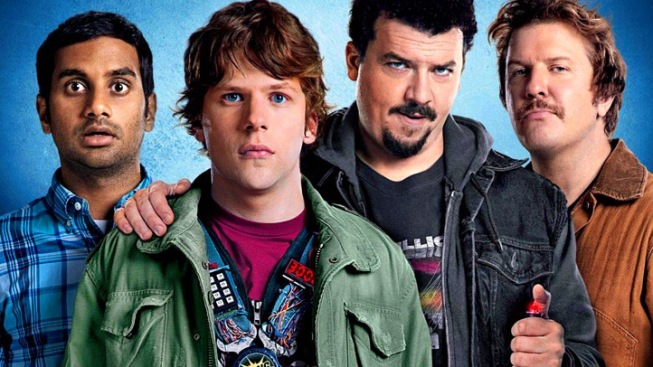 Eisenberg is Nick, your prototypical pot-smoking, going-nowhere deliveryman, his life a succession of no-win races against a pizza-chef bobblehead doll with a timer in its belly. 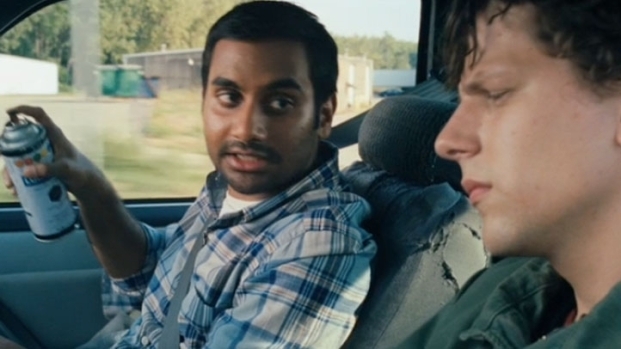 When he's kidnapped and wired to blow by Dwayne and Travis (McBride and Swardson), he runs to the school where his best friend Chet (Ansari) is a full-time substitute teacher, begging him to help him rob a bank. Dwayne is motivated to kidnap Nick by a need for $100,000 to pay for his father's assassination, so the old man will stop burning through his inheritance. Ansari and Pena each distinguish themselves in secondary roles. Ansari is simply a gifted comic, one of those people blessed with the ability to make pretty much whatever comes out of his mouth sound funny, and in "30 Minutes" he delivers time and again. There's something about his demeanor that's so unassuming and non-threatening, that even the most foul or stupid thing can inspire laughter. Pena again plays a darkly comedic Latino criminal (see: "Observe & Report" and "The Good Doctor"), and it's a testament to his talents that he manages to make each one distinctly different. Here he plays Chango, a hitman hired by Dwayne to kill his father, and the bravado, anger and contempt with which he snarls his way through each scene is fantastic. The film' greatest strength, however, is its economy. There's minimal exposition or backstory necessary, and most everything that happens builds logically towards the story's conclusion. There's not an ounce of fat on this thing, and in a year when seemingly every comedy feels the need to reach for 120 minutes, it's a relief to see someone tell their joke and walk away. It's hard enough writing an hour of good material, two hours is a bridge too far.